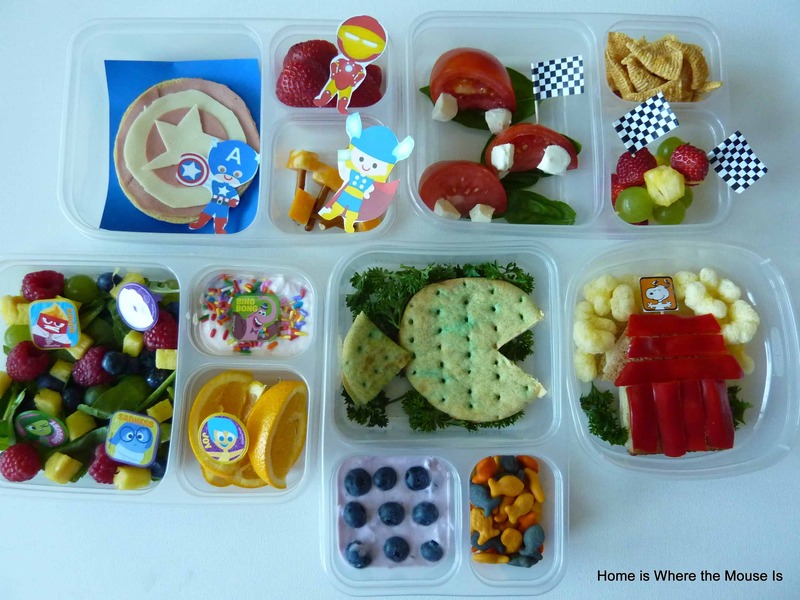 Send your kids back to school with any of these fun character themed lunches! This September my little guy heads to Kindergarten. To make the transition easier, I’m creating a week’s worth of lunches inspired by his favorite characters and movies. Hopefully seeing his “friends” at lunchtime will help put a smile on his face. Sending a child to Kindergarten the second time around is a totally different experience. While I had some concerns when Bella went, I knew that she would do well with the structure of a school setting. Jackson is a different story. 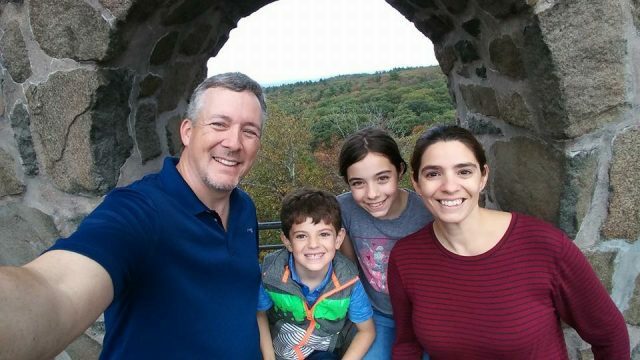 Although he has done well in Pre-K and academically is ready for school, I’m not sure how some of his quirks are going to mesh with the school day. Having been at home this whole time, as opposed to Bella who went to daycare, Jackson is used to setting his own schedule. One of my major concerns is eating. Jackson is a textbook grazer. Often times we will make breakfast or lunch and he’ll only take a few bites before saying he’s full. Sure enough, in 5-10 minutes , he’s back eating again. We’ve allowed this to happen by telling ourselves “as long as he’s eating, that’s ok”. Unfortunately, this behavior is not going to be allowed at school. As a mom, I have to come up with a creative way to ensure my child will eat during the school day. That’s where these lunches come in. Not only are these lunches fun, but since he tends to eat smaller quantities of food, I wanted to give him a variety as well. Even if he eats only a few bites of each selection, he’ll still be getting a good lunch. Also, I’m hoping that the fun themes and characters will help him look forward to lunch time at school. I created 5 lunches based on some of Jackson’s favorite characters and movies. I made sure to incorporate his favorite foods. 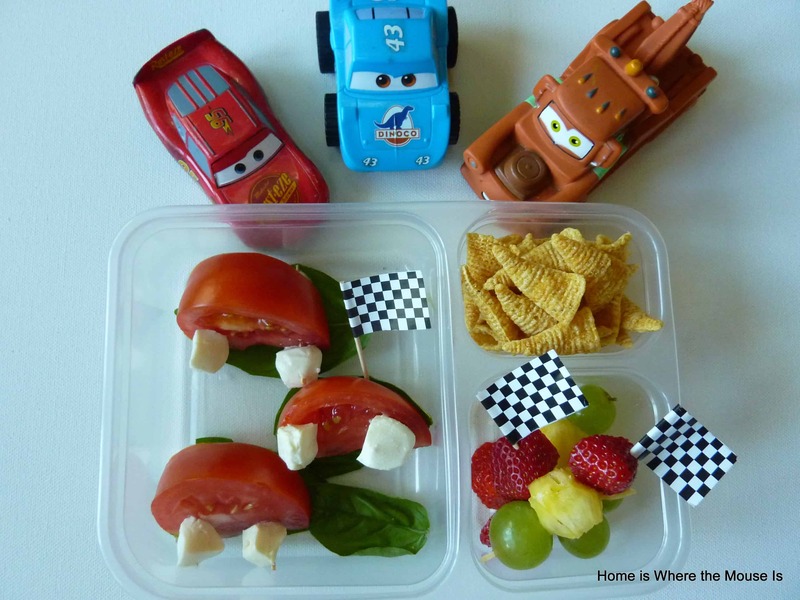 It didn’t take much to make these lunches come to life. I used items such as toothpicks, cookie cutters and cupcake toppers. I also used compartmentalized containers to prevent the foods from mixing. Tip: If you’re sending yogurt or jello, cover the compartment with plastic wrap or send it in a smaller individual container. Peanut Butter and Jelly “fish sandwich”, Finding Dory Goldfish, Mixed Berry Greek Yogurt with Blueberries. Tip: You can color your sandwich bread by lightly brushing it with gel food colored water. Emotion Salad (mixed greens, blueberries, raspberries, pineapple and grapes), orange smiles, Strawberry Banana Greek Yogurt with a dash of sprinkles (for fun). 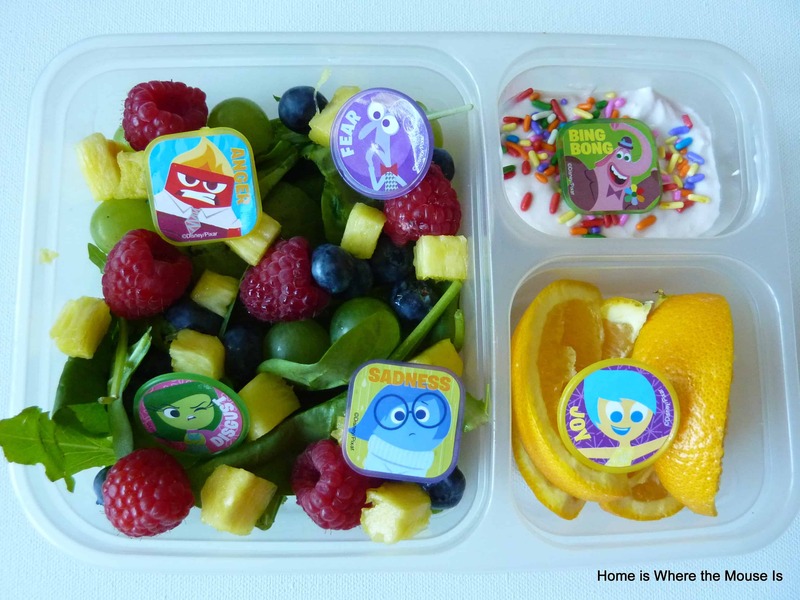 Tip: Cupcake toppers can be a fun decoration to add to any lunch. They can also be something to share with friends. Caprese (tomato, mozzarella) Cars, Cozy Cones (Bugles), Stop Light Fruit skewers. Tip: Toothpicks are a great tool to use to make fun lunches. They can help you make just about anything. 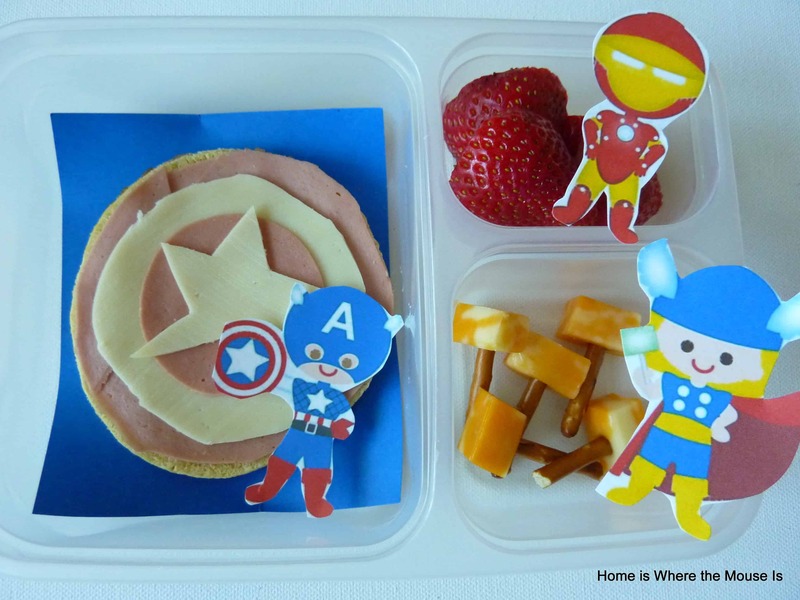 Open-face bologna and cheese sandwich on a roll, Thor hammers (pretzels and cheese), Iron Man strawberry masks. Tip: Cookie cutters and kitchen scissors can help you create shapes. *Not Disney, but Jackson is obsessed. 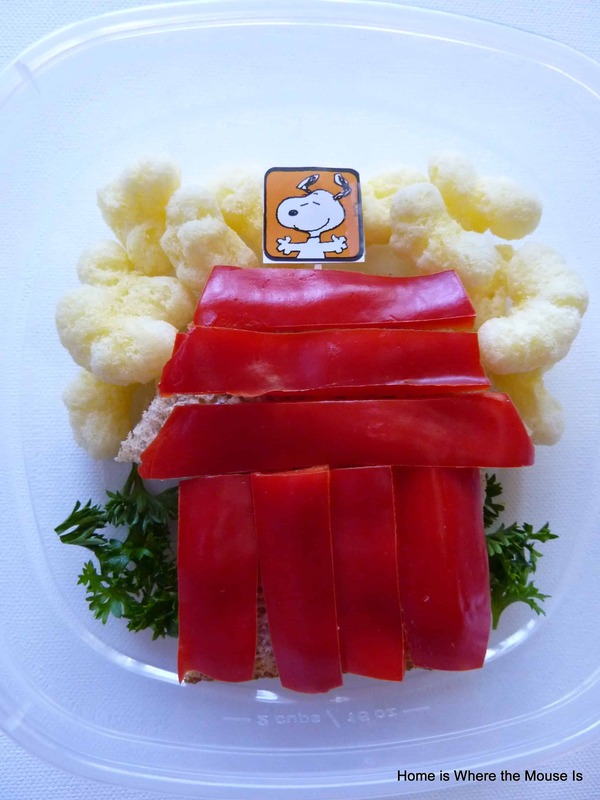 Turkey and cheese sandwich, red peppers, cheddar puffs. Tip: You don’t have to spend a ton on cute toothpicks. Make your own by using stickers, cardstock and toothpicks. Add a personalized note and you have one special lunch. I’m hoping these lunches will help Jackson start Kindergarten on the right foot. Thanks! Jackson is having the Avengers one for lunch today. He’s been asking me if it’s lunch time since 10 am. I think he’s very excited! These are so much fun!! Thor’s hammer…so clever!! 🙂 And delicious. 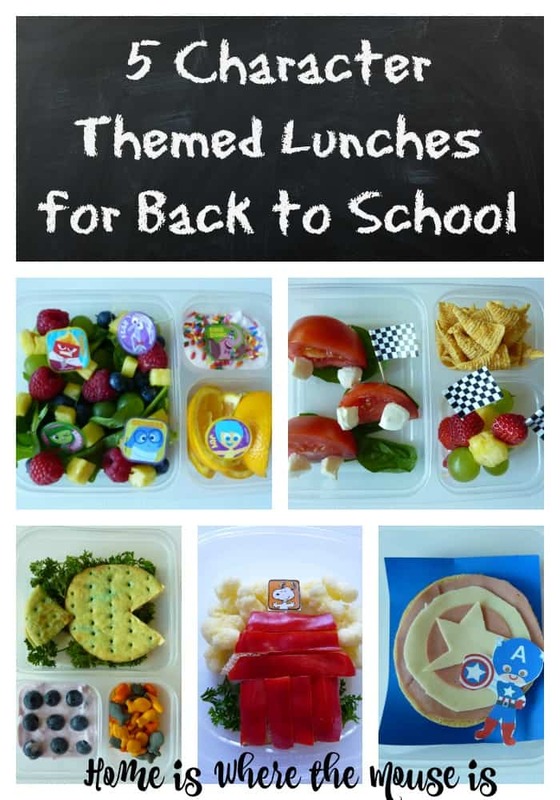 I think any kid would love these lunches. Thanks! My daughter mentioned that these would be great for boys and girls. 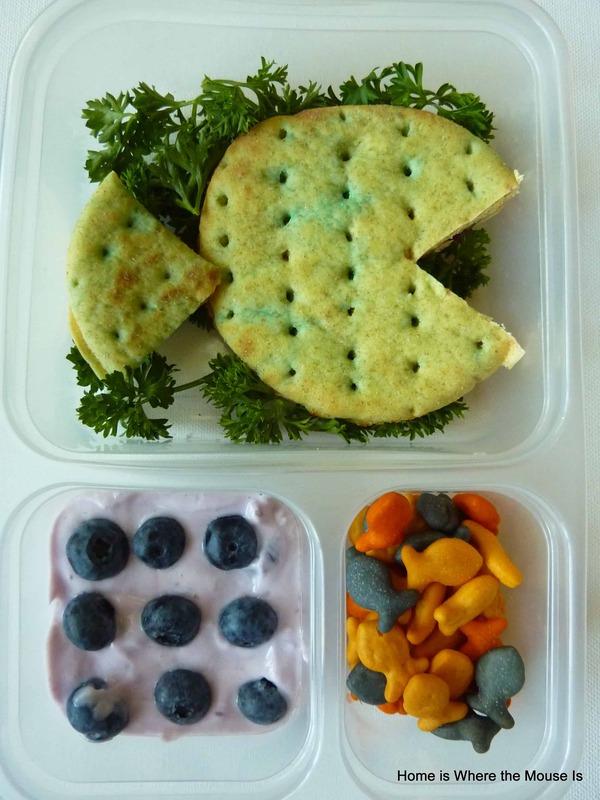 These have to be the cutest lunches ever. Jackson’s friends are going to be seriously jealous! And, if he’ll eat all those fruits and veggies, that is GREAT! Thank you! Thankfully fruits and veggies are the one thing he does eat. It is hard to get protein into him though. I think I’ll be making the peanut butter and jellyfish sandwich lunch soon. My kids are nuts for Finding Nemo and Finding Dory! Do you think kale chips work as a background? One of my kids would try to eat the greenery. My kids actually like seaweed sheets in their lunch. Your kale chips idea has got me thinking. I think a bed of seaweed for nemo is perfect!